The gorgeous Entrada golf course was designed in 1996 by golf course architect, Johnny Miller. This 18-hole golf course spans 710 acres. Tucked in the heart of Southern Utah’s beautiful desert landscape, you will enjoy breathtaking views of the area’s signature red rock cliffs, rolling dunes, and black lava beds. This golf course has seen its fair share of praises, and is boasting as Utah’s top year-round private golf course, and Golf Digest’s top 5 overall courses in all of Utah. 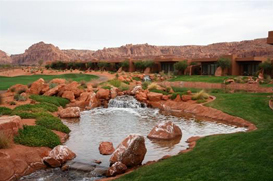 If golf isn’t on your radar, Entrada’s beautiful clubhouse also offers a Sports & Fitness Center with 13,000 sq.ft. of the best fitness equipment and also offers the latest trends in aerobic classes (pilates, yoga, etc.). You can also enjoy a game of tennis, pickleball, sand volley ball, or basketball. When you are looking to rest, you can relax in the indoor and outdoor pools or soak in one of their hot tubs and even enjoy any of their spa services. If you are feeling hungry after a long day on the course, you can satisfy that hunger at Entrada’s exclusive restaurant, Kokopelli Restaurant and Lounge. Chef Tony Olesh offers a menu bursting with flavor. Looking for something less casual for dinner? Entrada also offers a snack bar menu so you can enjoy a hamburger and soda while lounging next to the pool. The homes within Entrada are as immaculate as the scenery. These homes are some of the finest in the area. To view these homes, please take advantage of our free property search. Please contact is you would like more information on this community or on any of the homes in the area. We look forward to hearing from you.